We have just the right dumpster service for any size job. You will have a clear and safe site for your next job. 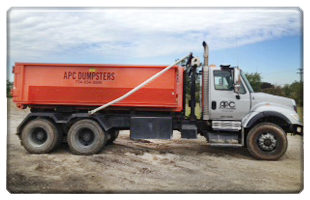 APC DUMPSTERS provides dumpster services for home, commercial and construction projects throughout S.E. Michigan. Look around and you will find the best place to rent a dumpster is APC. Regardless of what kind of cleaning project you have, we have roll off dumpsters from 11 to 30 yards at affordable prices for all your needs. For convenience, this is a great way to control your trash issues in a clean, cost effective , and safe manner. Call today for quality work and superior customer service.